Here’s a new little feature we’re trotting out to celebrate great moments in sports history (at least great moments in sports history that we can find on YouTube). If you’ve got any suggestions or nominations or clips, by all means, hit us up at triangle@grantland.com. Let’s get to today’s anniversaries! 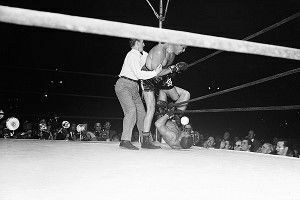 On May 23, 1941, Louis, the heavyweight champion of the world at the time, defeated Buddy Baer when the latter was disqualified at the beginning of the seventh round, due to Baer’s manager arguing with the ref over whether Louis should be deducted points for a late hit. Above, you can see the first three rounds of the fight, which was held at Washington D.C.’s Griffith Stadium. Who among us does not remember Native Dancer? Most of us. On this day, in 1953, the thoroughbred, nicknamed Grey Ghost (do horses need nicknames? ), won the Preakness. He went on to win the Belmont and Travers Stakes, which put him in the same company as Man o’ War, horse-wise. Anyone who knows me knows I like being underminey toward horses, so here’s some footage of Native Dancer losing the Kentucky Derby to Dark Star (who would later inspire the greatest Grateful Dead jam ever) (not really) in the same year, in lieu of any footage of his Preakness win. Native Dancer!